to provide public access to the natural environment. Three Lakes Conservation Area – between Graham, Centre and Temperance Lakes (Township of Front of Yonge, Township of Athens). Marshlands and Bayview Wetland are being acquired for environmental protection purposes. Three Lakes Conservation Area is for recreational purposes. A number of our properties have been purchased for forestry purposes. We currently own more than 4000 hectares of land throughout our watershed. 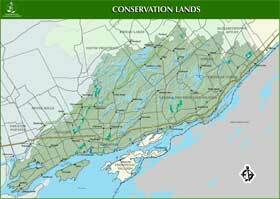 The location of our land holdings is shown on the Conservation Lands map in the sidebar. This image links to a larger version of the map in PDF form (3MB).